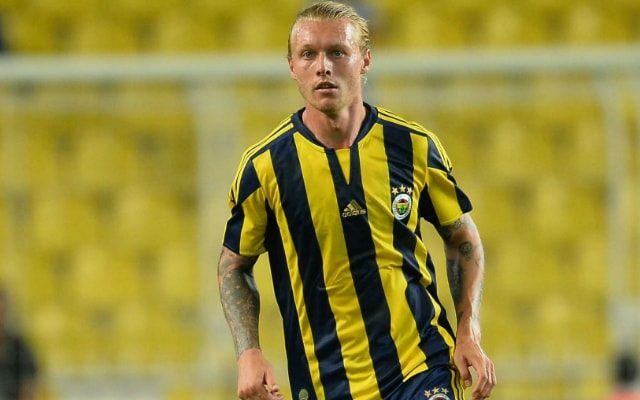 Arsenal are reportedly in a three-team transfer scrap over the signing of Fenerbahce defender Simon Kjaer this summer, along with AC Milan and Inter. The 28-year-old is vastly experienced having now played a significant number of games in Denmark, Italy, Germany and France, prior to his move to Fener in 2015. With 59 caps for Denmark to his name too, he has had plenty of experience at the top level, and according to Turks Voetbal, he could be taking his talents to the Emirates next season. The report claims that Arsenal are keen on the centre-half, although they will face competition from AC Milan and Inter for his signature. Further, it’s added that the two Milan giants have both offered €10m to Fenerbahce in order prise Kjaer away, although they’ve both been surpassed by Arsenal who have promised to splash out €12m. However, that still might not be enough as it’s suggested that the Turkish giants could be looking for something closer to €15m, and so the transfer battle could rumble on for a while yet until an interested party meets the demands. From an Arsenal perspective it’s an interesting potential signing. While Rob Holding has emerged as a real talent this season, his first at Arsenal, there is still a lack of quality and depth in that department of the squad. Whether it’s question marks over Laurent Koscielny’s future, Gabriel not convincing or Per Mertesacker’s ability to steer clear of injures, there are problems at the back for Arsene Wenger that he needs to address. Bringing in a player like Kjaer could be the perfect solution, as he can act as a calming presence in the dressing and at the heart of the defence next season. However, it seems that both Milan and Inter have the same idea.